Three-star offensive tackle Jake Majors of Prosper High School became the third member of Texas’ 2020 recruiting class on Thursday night, joining fellow offensive linemen Logan Parr and four-star Lake Travis quarterback Hudson Card. Majors was among an elite group of 2020 prospects visiting Texas on Saturday. The offensive line is a point of emphasis in the 2020 class due to a strong batch of in-state talent and now the Longhorns can claim two of the top six or seven in-state prospects at that position with more targets on the board. Skill set: Majors is a big, rangy offensive lineman with the frame to add weight and play offensive tackle or inside at guard. He needs to get stronger, but that’s true of every high school product, especially along the offensive line. It’s the frame and potential of Majors that intrigues college coaches. He moves well for a player his size and can get to 300 pounds before he steps on campus. The 6-foot-4, 285-pound prospect already held 14 offers, including one from Stanford. He’s currently the No. 40-ranked offensive tackle in the nation, per 247Sports composite. Majors will debut on the 2020 Fabulous 55 when it is released in February. He represents a great early pick up for the offensive staff and a player with real upside if given time to develop. Immediate impact: Offensive line isn’t the position to make an immediate impact. It’s usually a bad sign for a program if a true freshman is asked to step on campus and start. The Longhorns should be in a position to redshirt most of its prep offensive line additions. That’s what the Longhorns did with the offensive linemen in the 2018 class. The real impact is on the recruiting trail. Majors gives Texas another big offensive lineman to sell to skill position recruits, as well as to other offensive line targets in the 2020 class. Majors is another recruiter Texas can deploy on its recruiting targets. It’s also a recruiting win in Dallas-Fort Worth. Fitting into the program: Texas offensive line coach Herb Hand wants competitors with competitiveness and versatility. Majors checks those boxes as a prospect. He’s not a finished product and that’s okay. The three-star should be afforded time to develop under Hand and Yancy McKnight before playing important snaps. Recruiting at the position: Majors is the second piece for Texas in the 2020 cycle along the offensive line. Two of the other top targets — Jaylen Garth and Chad Lindberg — were also in town on Saturday to visit campus. The other is Galena Park North Shore standout Damien George. 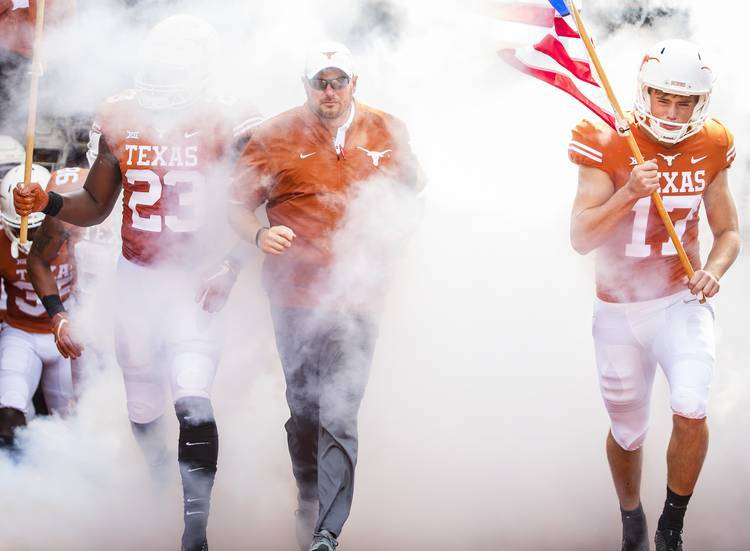 Signing all five of those players is the ideal scenario for the Longhorns and their 40 percent of the way there by February.